Last weekend (August 24-27) seven PA Randonneur regulars trekked to Canada and finished the Granite Anvil Randonnee. Congratulations to Mike Anderson, CJ Arayata, James Haddad, Larry Midura, Bill Olsen, Joe Ray, and Chris Slocum. With only 57 starters, 7 finishers is a significant portion of the field. 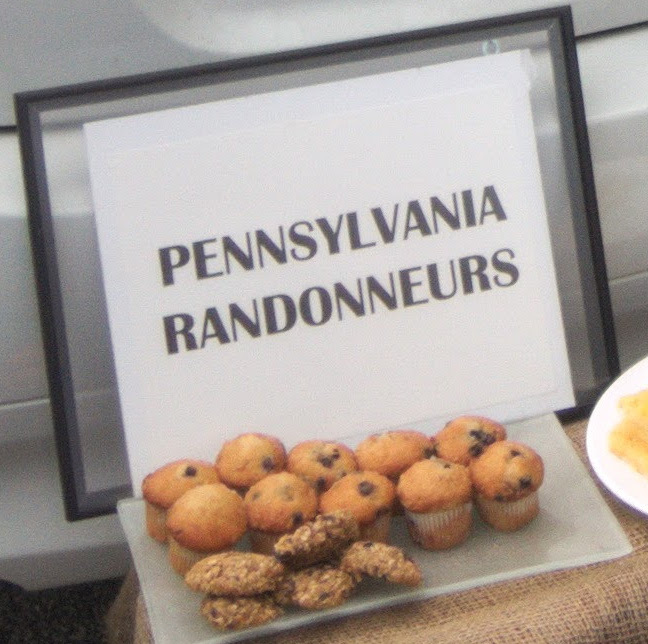 It just shows that randonneurs who frequent the Pennsylvania series are equipped to handle any 1200k, foreign or domestic. James H, Bill O., and CJ A. sporting their PA Rando colors. The route originally linked on the website is the regular route which will lead you into two chaotic construction areas where you are likely to have to carry your bike for a bit. A course checkout ride was completed by Jeff Lippincott on September 1. Minor edits have been incorporated into the cue sheet and updated on the website. Make sure you have the 9/2/17 edition. Get your registrations in and plan to join us next Saturday. The post ride refreshments are hard to beat. Parking will be in the lower parking lot to the left of the driveway where you enter. PA Randonneurs heads a little further west in September to run A Victory to Remember. Event and registration details are available on the website. Recall that this brevet was new in 2016 and enjoyed by all. So we're leaving the route alone for 2017 and will once again finish at the Victory Brewing Company in Parkesburg where good food and drink are plentiful and there's even a bike rack out front. Registration remains open until September 7, so make your plans to attend now. Although the humidity was high, the temperature was pleasantly moderate. Other than a few sprinkles in the late afternoon, the predicted T-storms never materialized. Even the dreaded Pottstown Detour of Doom was un-needed, as the scheduled construction still is yet to begin. Based on the smiling faces I saw eating ice cream at Jimmy's, the general consensus seemed to be that the reversed, revised, river to river ride was a good day on the bike, and much improved over last year's edition. I personally want to thank Jeff Lippincott who printed all the paperwork, manned both the start and finish controles, and basically dedicated a couple days of his life to helping run this event. Awesome volunteering. Also, a special PA-Rando round of applause and thanks goes to George Retseck's wife Beverly who set up a secret controle with home-made snacks at the top of the climb out of Coopersburg. Yummy! Snacks courtesy of Beverly. Yeah! CJ Arayata Writes... I offer many thanks for the work you put into developing the genuinely beautiful YARRR course! Pleasantly surprised by the scenery considering it was much more "suburban" than the tried-and-true PA course library. Also, I know you and Jeff are solely responsible for keeping the nearly-certain rain at bay, so for that I offer you my thanks as well. James planted the single-speed-seed a week or so before the brevet, and it had more than adequate amount of time to germinate for this weekend's brevet. The front-loaded climbing was BRUTAL on cold legs but I was able to settle into a rhythm for the rest of the day. It was a pleasant surprise that the front group stayed together for the first 2-3 hours, and I had a great time chatting and catching up with everyone, as I really haven't been riding since the conclusion of the SR series. 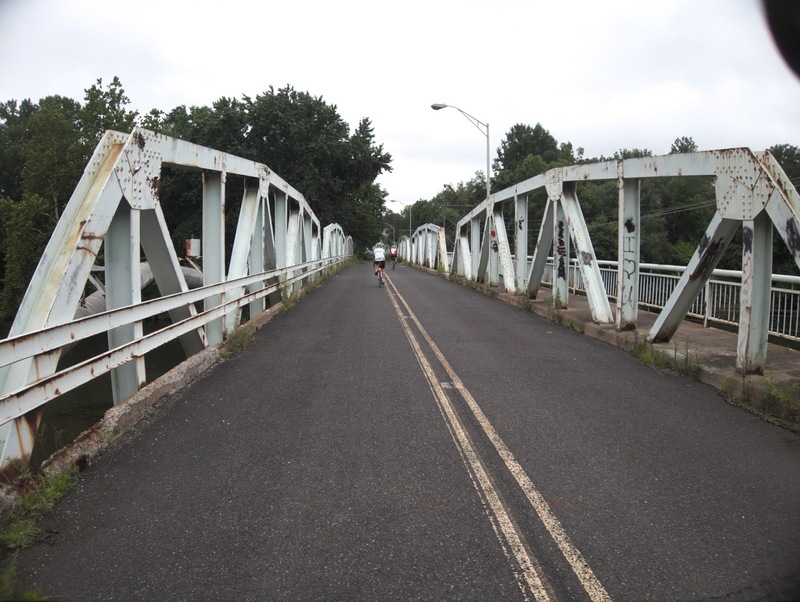 Coming into Pottstown, it was Rudi, first-timer Anne, Scott, George and I. We decided to lunch in Phoenixville at a real cafe vs. the Wawa options, and made great time for the first half of the ride. Rudi pressed on without a panini, and we were down to 4. The skies, while looking quite ominous at times, turned into clear and sunny skies which I enjoyed thoroughly (but my skin did not). Most of the climbs in the later part of the day were totally fine.... I mean bearable in 46x18, save for one steep kicker that had me racing Scott to beat him up the climb using my 24-inch gear! Things got ugly for me leading up to the church controle (although that particular climb was gorgeous) and I apologize to my riding partners for having to put up with me for what felt like an interminable amount of time. My spirits rose dramatically after a watermelon break at Milford Market with George. We took it easy on the last leg, knowing that even if it started pouring any second, we were close enough to the finish that it was the least of our worries. A hot dog and milkshake at Jimmys, plus Anne's alternate canal path back to our cars was a perfect way to end the day [always trust the local!]. Crossing the historic Keim Street Bridge in Pottstown. Really glad to see new faces coming out, and really excited about new routes into previously-unexplored territory! Had a great time and excited to see everyone again in the fall. 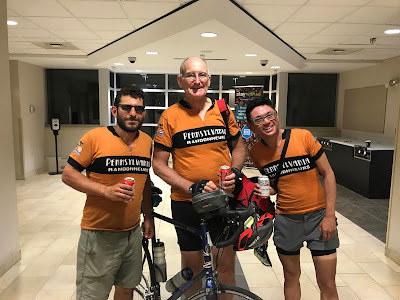 James Haddad writes... Andrew, Chris, Jeff and all the EPA randomly volunteers -- Thanks for putting together another great ride. The 500 cues, two appendixes and epilogue were worth it as we gently meandered through the suburban sprawl of Eastern PA on the most scenic and calm roads. Riding the route in reverse didn't just add an extra R to the name, but, it made for a much appreciated gentle afternoon after a challenging morning. 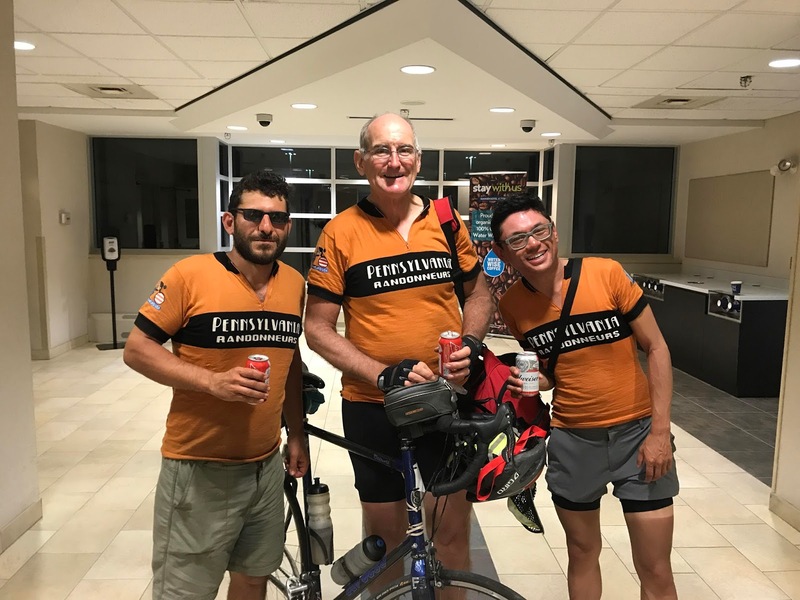 In the mayhem that typically follows a brevet weekend, it's sometimes easy to overlook the accomplishments of our members. Last month was one of those times. James began his streak last August and completed his stretch on last month's Hawk's Nest brevet. All the more impressive is that James lives in Binghamton, NY which means he normally faces at least a 2-hour drive each way before he even gets on his bike.